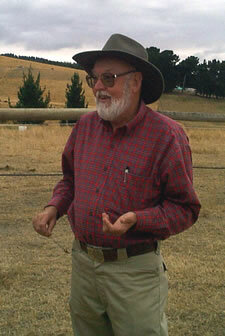 Animal pshysic Bill Northern reckons he can talk to the animals and more importantly he reckons the animals talk back. Despite this claim American Bill Northern seems to be perfectly normal. Bill Northern points a horse owner in the direction of their horse's sore spot - with a little help from the horse, of course. "Everyone's a skeptic. God! I was too. I would have committed myself to the funny farm. Since then, I've just been telling people what the animals have been telling me," says Northern. So normal in fact, that for decades he operated an office supply company in the US. It wasn't until he retired that he started to listen to what the animals were saying. He does this after dowsing. Dowsing is defined as the art of manipulating objects such as a pendulum, crystal or stick to enter a meditative state in which the psychic currents of the universe become apparent. Dowsing is more than looking for hidden water with a forked stick. 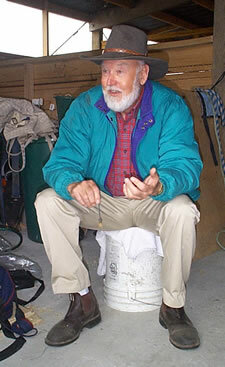 Bill had always been interested in dowsing but decided to take his hobby further and went to a dowsing school. It was during this time that he found out how bad he was at it. One test involved using a pendulum to enter a meditative state and working with several animals -- he got all the answers wrong. Since then he's had a lot more practice and he's got a lot better at listening. He says that "learning to listen is something you do when you get older." These days he talks to a huge variety of animals, all of which talk to him, but not all of which tell him what he wants to know. Bill said that cats, in particular, are inclined to tell lies. "They tell fibs, in fact they'll tell you just about anything just to get you to go away. I don't like talking to cats, and they don't like talking to anyone." And dogs, well he reckons that most of them are quite sensitive. They don't like to hurt their owner's feelings and will be quite subtle. Bill also says that most dogs do like to please and that many are easily offended. When an animal talks to Bill he hears words just like when a person speaks to him. And, not all animals sound the same, they all have their own voices just as humans do. He also pointed out that most animals are not interested in solving the problems of the world so their conversations tend to be about everyday mundane things. Bill said a typical conversation with a horse would be: "The hay is delicious today but my owner was horrible to me last week so I'm going to stomp on his toe when I get a chance." Or, "my saddle blanket is really itchy. My saddle doesn't fit properly and my owner makes me work too hard." Generally horses look down on us and they think that humans are around to run after them, says Bill. "And cats, well they think, "Dinner's late I better make more noise or some of them will think: 'I better go kill something!" Bill knows this because the animals talk to him and tell him so, he says. Bill also feels what the animal feels. If the animal's got a pain in the leg Bill will also get a pain in the leg. The difference is that Bill will be able to pinpoint the exact problem and while he might not be able to fix it he can give the owner an indication of who to contact about it. Bill has been coming to New Zealand each year since 1989 and in that time he's been able to help people find their animals, diagnose health problems in animals and make peace between some owners and their animals. For instance he located a dog which had been lost for 10 days and he's been able to help many owners isolate and remedy health problems in their animals. It might all seem a little hard to believe but as they say "seeing is believing." While I was waiting to interivew Bill I was able to witness several consultations where Bill was "listening" to the animals. I was also able to see the amazed, and sometimes embarrassed expressions on the faces of some of the owners of these animals. Turns out that not all the animals spoken to that day were altogether happy with their owners. Some of them did have axes to grind and while it was amusing for an observer it was clearly off-putting and in some cases "a little too close to home" for some. Bill was also able to communicate over distance with several animals and was able to tell owners details he could not possibly have known unless he'd seen the animal. All in all, Bill Northern is definitely amazing and while it's hard to believe something you can't see or hear, watching Bill at work is not something you can shake off lightly.